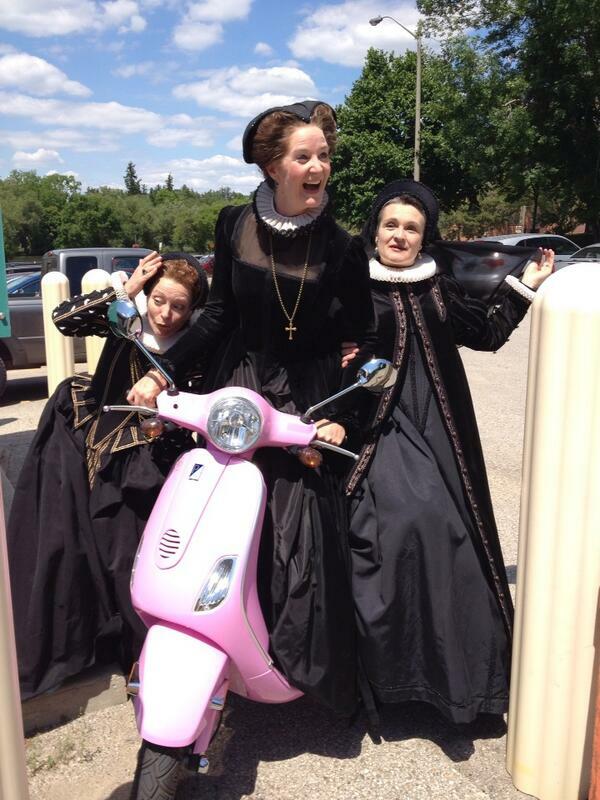 These are three lovely company members of the Stratford Festival (Brigit Wilson, Carmen Grant, and Deidre Gillard-Rowlings), who, over the past month, have been making the most of their roles as citizens of Angiers in the current candle-lit Original Practices production of King John. Now, I have scoured the text of King John, and nowhere do I find reference to either powder pink mopeds or bowling, so I am forced to admit that the self-styled Ladies of Angiers, despite their sober Elizabethan garb, have strayed rather monumentally from the Original Practices doctrine. However, I think we can all agree that that is to the greater benefit of the world at large. Join us again on Wednesday for more Ladies of Angiers action!